Our First Atlas text concluded with the sentence ‘There is no doubt that most of the Cheshire meres provide ideal breeding sites for the Ruddy Duck and have played an important part in its colonization of Britain’. Since then, they have spread further across the county and Ruddy Ducks have now bred on most of the county’s lowland waters. The ‘change’ map shows that in the last twenty years they have expanded into the Wirral and along the Mersey valley, although birds have been lost from many sites across the rest of Cheshire. The submitted habitat codes show that nearly all birds were found on standing waters, mostly the larger ones, with some waterside vegetation in which to hide their nest. These are the last ducks to breed each year, with chicks seldom appearing before July, and broods hatching sometimes into early September. Males in the breeding season indulge in conspicuous display, but they are not territorial and many mate promiscuously without forming stable pair bonds with females. The typical size of their single clutch is 6-10 eggs, although observations at Woolston show that some Ruddy Ducks lay one or more eggs in another species’ nest, usually Tufted Duck or Pochard, but occasionally Mallard, leaving their offspring to be raised by another female. There can be large annual fluctuations in numbers of Ruddy Duck broods, often related to changes in water levels through the season: at Woolston only 5 broods were seen in 2004, 12 broods in 2005, and 10 broods in 2006. It is impossible to discuss this species nowadays without mentioning ‘the cull’. The Ruddy Duck is closely related to the White-headed Duck Oxyura leucocephala, but their conservation status is very different: Ruddy Ducks are common and widespread across their native north America, with a population of half a million or more, but White-headed Ducks are endangered, with fewer than 15,000 birds spread across their range of Spain, north Africa and Asia. Measures to protect and restore habitats and ban hunting have helped the Spanish population to rise from 22 in 1977 to 2,500 in early 2003 but the critical threat to this species was identified as hybridisation with immigrant Ruddy Ducks from Britain. A group of UK conservation organisations spent many years, starting in 1992, researching the issues and eventually concluded that the only solution was to eradicate the Ruddy Duck from Britain in order to prevent possible extinction of the White-headed Duck. This proposal to cull Ruddy Ducks, agreed by the UK Government in March 2003, aroused some impassioned debate amongst nature conservation and animal welfare organisations, and professional ornithologists and amateur birdwatchers, with journalists and economists pitching in, and even some political activists complaining that it is ‘racist’ to try to preserve a species. 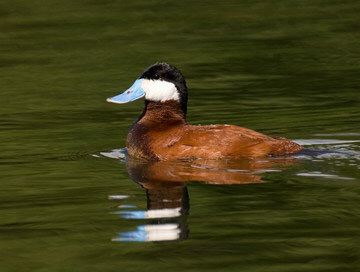 The UK Ruddy Duck eradication programme started in autumn 2005. By mid-winter 2006/ 07, the UK population had been reduced to about 2,000 birds, just one-third of the level in January 2000. Some observers have not submitted records to the annual county bird reports in protest at the cull, and it is not known if any have withheld records from this Atlas.